Crankshaft: Fully Counterweighted 4340 Billet. Main Caps: 3″ Main Diameter / 1.325″ Wide,Cross Bolted with 1/2″ Bolts and 9/16″ Main Studs . Connecting Rods: Forged I Beam, 4340 Steel / ARP Rod Bolts. Pistons: Forged Aluminum / 1.094″ Pin Dia./ Pin Buttons / 5/64 x 5/64 x 3/16 Ring Lands. Cylinder Heads: Virgin A356 Aluminum / Steel Seats / 454 Chevy Exhaust Flange Pattern / 6 Head Studs Per Cylinder. Rocker Arm Assembly: Shaft Mount Aluminum Billet Rocker Arm Bodys / 2.0 to 1 Rocker Ratio / 7/16 Dia. Adjusting Screws / Oil Pressureized Bearings. Camshaft: 8620 Steel Billet / 2.250 Torrington Roller Bearings / 1.400 Dia. Base Circle / Hydraulic Roller Tappet. Camshaft Drive: 50 mm Belt Drive / Cam Retaining Plate / 6 Bearing Journals. Valves: 2.400″ Dia Stainless Intake Valve / 2.000″ Inconel Exhaust Valve / 11/32 Stem Dia. Oil Capacity: 5 Gallons with Dry Sump / 14 Quarts with Wet Sump. Cooling System: Self Contained / Fully Enclosed Heat Exchanger / 195° Thermostatically Controlled System. The performance boat industry has always required engine assemblies that produce large torque and horsepower values. In the past, the standard has been a supercharged large cubic inch passenger car cast iron engine assembly. The engines have provided the required performance but not the desired reliability due to their not being designed for the stress loads involved. The available aftermarket aluminum blocks suffered from problems associated with their being reworked automotive blocks. This set of circumstances was not being addressed by the industry. Steve Mugerauer, proprietor of Competition Products in Oshkosh Wisconsin, being very familiar with this situation, began to make plans for an engine assembly that would produce the required horsepower and torque at both low and high RPM range and also be durable and reliable. As he developed an effective strategy to accomplish his goal he invited representatives from racing engine component companies to confer on the project forming a coalition of engineers. Noel Manton of Manton Engineering was chosen to head up the project and be the liaison to all involved which would finish with an engine conceived from scratch to fulfill it’s role. Famous for his work on valve train harmonics and camshaft design while at Sig Erson and after forming his own company, Manton was the easy choice for this job due to his engineering skill and his affability. This group started its work of designing and drafting the major components of the project. Because each phase of the project would be handled by the most talented engineers in their field Mugarauer decided to call his new production company “Allstar” and the Allstar Engine Company was formed. The first item on the agenda was the block itself. It needed to be able to effortlessly contain a large cubic inch displacement. This phase of the project went to Nick Arias, a legend in the racing industry. Perhaps most famous for producing fine racing pistons, Arias is probably the most knowledgeable aluminum racing block engineer and has done the original design work for many of the most famous engines of that type. Arias produced a block design of cast T356 aluminum that would use nodular iron wet sleeves. The design shared motor mount pads and bellhousing configuration with a big block Chevrolet. These characteristics were chosen to facilitate the use of the block in new or existing applications, but apart from that, the design was unique unto itself. Second generation blocks were machine by Brad Anderson. The deck height was set at 12.125″ with cylinder spacing on 5.400″ centers. The bore was set at 4.750″. The main line was configured at 3.0″ and the stroke at an even 5.00″. Thus the engine had a cubic inch displacement of 708 and a rod angle of a perfect 1.6 to 1. The elegant design was both big and rugged with each main bearing cap cross-bolted and the block finishing with a dead flat pan rail and cross bracing in the valley making it a uniform whole. Dave Barrow had left Keith Black the year before to head up a project at Arias known as the “Century”, a tall deck, raised cam, spread pan rail big block Chevy. Having successfully booted up that project he had managed to produce what many thought was the finest Chevy block that had ever been made. He was at Arias. Manton cut through protocol and contacted him directly. A jocular, unconventional guy, Barrow listened and agreed to help. Within a week the parts were on order. Soon there was a finished block. Manton flew to Los Angeles to inspect it. Minor changes were agreed to and the logjam was cleared. Blocks began to be shipped to Oshkosh. Now the engine was really taking shape. Keith Lowandi at L.A. Enterprises completed the first crankshaft. Mickey Williams, the Murrieta California based artist with aluminum sheet metal finished the oil pans and made up a prototype intake manifold. Howard’s cams shipped the first of the camshafts ground to Manton’s specifications. The belt drive arrived from RCD. The valve train components arrived from Manton’s own California based company. The heads had been finished and shipped from Canfield. Todd Goodwin of Goodwin Competition carefully assembled the first engine at his Omro Wisconsin engine development facility. The first test firing of the engine produced by Mugerauer’s group of all-stars was about to take place. The engine was placed on the Dyno and the automatic controls were set. People were grouped around waiting anxiously. Goodwin double checked everything and pushed the starter button. The engine turned over twice and sprang to life. Everyone broke out into a grin as the dyno brought the engine up to 3000 rpm and held it steady. People shook their heads and smiled and laughed as the engine sat on the dyno and sang its song. In only 19 months Steve Mugerauer’s idea for an engine had become a reality. An effortless 800 horsepower that can run all day and all year without hurting itself. 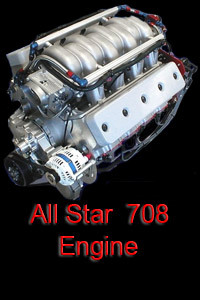 The Allstar 708 has tremendous potential and is perfect not only for marine applications but also for tractor pulling, mountain motor drag racing and stationary power plant applications.